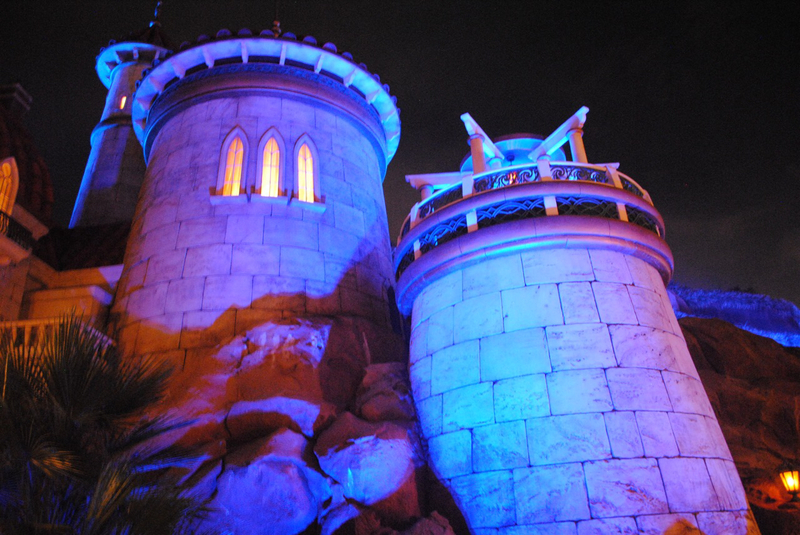 This ride follows the story of The Little Mermaid. It is an omnimover dark ride situated in the New Fantasyland area within the Magic Kingdom. The ride opened on December 6, 2012 after soft opening on October 12, 2012. Up to three riders board clamshells with a single shared lap bars. Riders then proceed towards Scuttle who greets them and starts narrating little parts of the story. The clamshell then flips backwards and a projection of bubbles is seen on the clamshell vehicle in front of you. This effect is also coupled with a curtain of cold air to simulate the feeling of going underwater. Guests then get their first glimpse of Ariel above, who is presented as a silhouette. You can also hear Part of Your World playing from the next area. Once your clamshell turns back around, you are face to face with Ariel who is singing Part of Your World while holding a statue. Flounder is floating next to Ariel in this scene, and also Sebastian can be seen poking his head out of the various thingamabobs. From here guests move along a tunnel filled with stationary sea creatures. Once through the tunnel, we are once again greeted by Sebastian who is hosting a party. Most of the sea creatures help recreate the tune Under the Sea and even Ariel is in on the fun. She can be seen dancing just outside of the next area. The Sea Witch isn’t too far away in the next area. Here she can be heard spewing her incantations and singing Poor, Unfortunate Souls. Scenes from the movie can be seen in her crystal ball, along with some ingredients she uses in her potions to right along the wall. Moving on, guests are greeted with a projection of Ariel who has appeared to grow some legs. The clamshell then moves “above water” in the same way it descended and into a tranquil lagoon. Prince Eric and Ariel can be seen in a boat together as Sebastian serenades them both with Kiss the Girl. Next, Ariel regains her voice since she and Eric are in love. Ursula can be seen off in the distance, who is now defeated. In the final scene King Triton, Sebastian, Flounder, and several sea creatures celebrate the wedding of Ariel and Eric. They wave goodbye from their oceanfront gazebo. Scuttle is out front next to the riders, he caps off the story and wants everyone to know that he’s “not such a bird-brain after all“. On March 4th, 2015 the ride opened after a short refurbishment. Various static fish and sea creatures were added in areas of the ride that were lacking in props. Ariel, and the other humans had their hair replaced with more lifelike material. Previously their hair had been rubber that was molded.